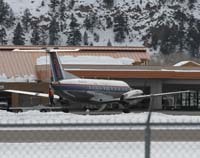 Courtesy photo A SkyWest Airlines flight pulls into the terminal at Friedman Memorial Airport. The Friedman Memorial Airport Authority made progress on communications, decision-making and meetings with the FAA on Tuesday, despite light attendance at its monthly meeting. Prior to the meeting, Blaine County commissioners and the Hailey City Council formed documents known as "guiding principles" that were meant to shape the decision-making process for either building a new airport or making improvements to the existing one. Though many of the principles of the documents are similar—such as the importance of commercial air service to the valley and airport relocation as a long-term goal—the principles adopted by the city of Hailey place more emphasis on relocation rather than improvements. "Until the [Airport Layout Plan, which would allow for improvements to Friedman] is developed and presented for consideration ... the City supports the present configuration and operation of Friedman Memorial Airport," the document reads. County Commissioner and authority board member Angenie McCleary said the differences were not insurmountable, and board member Susan McBryant said putting the goals in writing would help the process enormously. "To have both owners commit this to writing has been really constructive," McBryant said. "They are highly consistent, but there are points where they go in different directions. We know in advance what hurdles we might face." The authority board voted to approve both documents, rather than merge them to form a set of consistent principles for the board itself. Hailey City Councilman Don Keirn said that trying to sort out the differences between the two sets of goals may take more time and effort than the process would be worth. "We spent enough time on these, and that could take another six months," he said with a laugh. "And we'd still end up with differences." The goals are available on the airport website, www.flyfma.com. Airport Manager Rick Baird said he is still striving to set meeting dates with the Federal Aviation Administration in Seattle to discuss the authority's dual-path approach to both improving the current site and restarting the environmental impact statement for a replacement airport. No meeting dates have been set, and Baird said new FAA Northwest Mountain Region Airports Manager Carol Suomi would prefer to keep the meetings small—meaning none of the authority members are necessarily invited to attend. When questioned about the meeting delay, Baird said the struggle over scheduling is likely not procrastination. "For the first time in five years, the FFA's funding is multi-year authorized," Baird said, citing a bill signed by President Barack Obama earlier this month. "My guess is that the FAA is extremely busy right now trying to figure out how they are going to operate. I don't think this is an attempt on the FAA's part to slow things down." Baird added that Suomi said she planned on coming to the Wood River Valley sometime soon to discuss the airport process. "She said she owed the community a visit," he said. The Friedman Memorial Airport Replacement Airport Project has been officially rebranded as the Friedman Memorial Airport Solutions project, in an attempt to encompass both improvements at the current site and future relocation. "It's what we want, and there are multiple solutions," said Candice Pate, the Airport Authority's interim communications director. Pate originally asked the board to consider changing the name of the effort to relocate and improve the airport from the Friedman Memorial Airport Replacement Project to the Airport Improvement Project. But Hailey City Councilwoman and authority Vice Chair Martha Burke said she vehemently disagreed with the original suggestion. "It leaves out the parallel path in the very simplest of forms," she said. "It says we're going to make improvements at Friedman. The title does not address the parallel paths." Pate said that was not her intention and agreed to the change. Airport staff will begin implementing the change this month.